Newborn hearing screening helps identify babies who have permanent hearing loss as early as possible. These babies and their families can then get the support and advice they need right from the start. The NHSP’s new IT system, SMaRT4Hearing (or S4H for short), was switched on at midnight on 1 December and information for newborn babies started to appear on the system soon afterwards. S4H has been the screening programme’s biggest challenge since its introduction back in 2006. It will eventually replace the existing system eSP. Until then the 2 systems will be used in tandem. The much-loved eSP system has served NHSP extremely well and helped manage nearly 9 million babies through the screening process over the last 14 years. Today sees the culmination of a 2-year project which has focused on switching from the old eSP system to NPS’ new SMaRT4Hearing system. It is an immense achievement and a model of how a true collaborative approach should work. The challenge thrown down to the team was to plan the transition from the old to the new system through a ‘big bang’ approach. Every baby born since midnight on 1 December will be managed through the new system, causing no interruption of service. This was a highly complex task with more than 2,000 registered users across more than 200 locations and using thousands of screening devices . This has been a major undertaking not only for the PHE and NPS teams but also for staff in local NHSP programmes across England, who have been busy over the last few weeks preparing for the big day. Initial reports have been very favourable. Although screening staff had been able to use a training system, yesterday was the first time they had used the live system. Many NHSP local managers went into work early on 1 December to ensure there was a smooth introduction of the system in their site. The first baby to be screened and have their results appear on S4H was from Birmingham – and baby and screener are both doing well! Finally, after such a long time, our new national IT system SMART4Hearing is here. Our management team has worked hard to get ready for the change and ensure our screeners are ready for the new system. So we were excited but nervous about today – hoping it would be the calm after the stormy weeks of getting prepared and completing training and the PHE tasks and checklists. While I was still at home getting ready for work, I had a text from Suzanne, one of our senior screeners based at City Hospital Birmingham, saying she had completed screening at 06.47 am and had uploaded the results for a baby on S4H. Fantastic news – and no mention of problems. On the way into work, I rang all of our screening sites to check progress – no other babies screened yet, but babies appearing on S4H. Great to hear. It is finally real – I think everyone was looking forward to today as practising on the training system is useful but not real life. Suzanne said the team at City Hospital were keen today with a few coming in early to get stuck in. There hadn’t been that many births today since midnight so it will be tomorrow when we really get into the swing of the new system. It took a while today finding everything on the baby’s record but we got there. Mum and Dad were keen to have baby screened so early in the day as they were almost ready for discharge from the midwifery-led unit, as well as being happy to be part of something new. 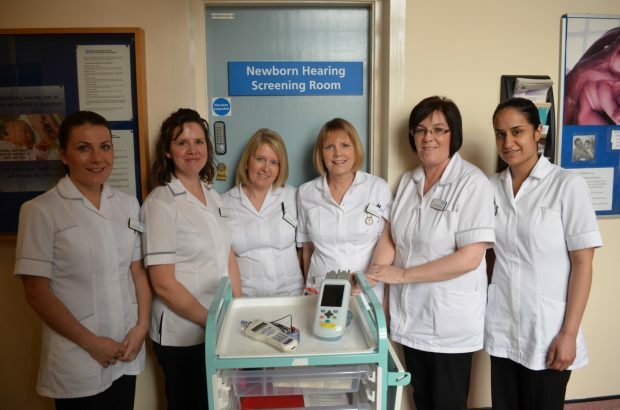 The midwives were really excited too about the new system and having the first baby screened on S4H in the country.